Now, I have never participated in blog awards before, but since I have recieved quite a few over the last month, I figure I'll play along! Pass the award to 10 other blogs that you’ve newly discovered. Remember to contact the bloggers to let them know they have been chosen for this award. From Priya I have the award for sheer awesomeness. Need I say more? All right! That was fun. Thanks guys! You beat up a cop? Hmm. I would think I'da heard about that one. And pay attention to radioactive decay. What if we have some in our house? You're the only one who'd know what to look for. Loved finding out a bit more about you - especially the maths stuff! I am a maths teacher and it's hard to find people out there who will admit to loving factorising polynomials! Ooh thank you so much for the award! :) Your blog is fantastic, by the way. And talk about honesty, great answers. Congrats on your awards!! 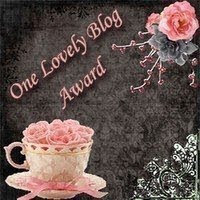 And thanks for the One Lovely Blog Award!